BetOnline is one of the most well-known sportsbook brands in online sports gambling. The site has been in business for decades and is licensed and regulated in Panama, establishing itself as one of the most competitive brands in the industry. BetOnline’s sportsbook was designed to give bettors opportunities to bet on all kinds of sports and has betting lines from all over the world, including some of the best prop bets around. BetOnline’s odds are similar to the ones you’d find in Vegas sportsbooks and they have features like live in-game and mobile betting. Their Welcome Bonus gives you 50% match on your first deposit up to $2,500. Their Lifetime Bonus Guarantee grants you 25% on all qualifying deposits for life. Read our full review of BetOnline’s sportsbook for a better idea of how the brand operates. Is Betonline Sportsbook Legally Sanctioned And Regulated? Yes. BetOnline is a legally licensed sportsbook provider operating out of Panama. They are regulated by the Panamanian government and held to a high standard. The site also holds compliance certifications for fair use, including with their RNG technology in their Casino and Poker departments. BetOnline has been operational for decades and has established a strong professional reputation over that time. Betonline does not have any state restrictions like Bovada sportsbook does. So they accept players from all 50 states with open arms. The following countries are not allowed to play for real money at BetOnline: United Arab Emirates, Albania, Switzerland, Algeria, Estonia, Japan, Malaysia, Tunisia, Turkey, New Zealand, Russia, Oman and Vietnam. BetOnline has several bonuses for their sportsbook users. The first of which is their 50% Welcome Bonus. This bonus grants you 50% added onto your sportsbook account with your first deposit. A minimum deposit of $50 is required to claim this bonus and the maximum deposit amount is $2,500 (max amount only for claiming this bonus; can deposit more later). There is a 10x rollover required before any payouts can be issued with your bonus. The second bonus is their Live Betting $25 Free Play. With this bonus, you bet $25 in BetOnline’s Live Betting section. If you win your bet, you are on your way to profiting. If you lose your bet, you will be refunded with $25 worth of free play. There is a 6x rollover associated with this bonus. You can initially deposit more than $25, but the bonus only covers $25. Their next bonus is similar to the Live Betting one, but deals with Mobile Betting. BetOnline’s Mobile Betting $50 Free Play backs you for $50 with your first mobile bet. If your bet falls below $50 you can claim whatever your bet amount was in free play. There is also a 6x rollover with this bonus. BetOnline’s Lifetime Bonus Guarantee is the bonus that sets them apart from other online sportsbook brands. This bonus grants bettors a 25% bonus on every single deposit you make (minimum $50) with the sportsbook. There is a 6x rollover required before issuing any payouts. You can claim this bonus by entering the appropriate promo code with each deposit. Users can claim up to $100 for each friend they refer to the site through BetOnline’s Refer-A-Friend program. All you have to do is pick which method you’d like to use to invite your friend (Facebook, email, etc.) and once they sign up and deposit you can claim your bonus. BetOnline has a long list of betting lines from sports around the world. You can bet on basketball, football, soccer, baseball, hockey, boxing matches, MMA fights, horse races, tennis and many more. BetOnline opens their betting lines before anyone else in the offshore industry, giving users an advantage in terms of being aware before anyone else. Their betting lines are comparable to the ones you’d find in Las Vegas, only BetOnline offers more. There are a number of wagering types available to bettors through BetOnline. When you open the sportsbook, the first wagering types you’ll notice are bets on or against the point spread (or “Run Line” with baseball betting lines, for example). You’ll see over/under bets and money line bets (betting on a team to win outright no matter the exact score line) as well. BetOnline has a wide range of prop bets available, including props for special events like the NFL Draft, and future bets. You can parlay any bets you make, place teaser bets and more. Their wagering type options allow bettors to expand on their betting tendencies and provide opportunities for more bets to be made. Credit/Debit Cards – BetOnline accepts Visa and MasterCard with a minimum deposit of $50 and a maximum deposit of $5,000. All transactions are processed in real time and deposited straight into your account. Transaction could be considered cash advance pending your financial institution’s policies. BetOnline is not responsible for any additional fees in such cases. Digital Currency – Bitcoin and Litecoin are some of the fastest ways to deposit and receive payouts with BetOnline. Both options come with a $25 minimum and $25,000 maximum deposit. No additional fees applied. BillPay by Money Gram – Deposit money into your account using Money Gram’s BillPay service. There is a minimum deposit amount of $100 and a maximum of $900. Once you deposit money into Money Gram you can transfer it to your sportsbook account by entering the Trace ID and BillPay Control Number (both provided upon successful deposit). MoneyGram Person To Person Money Transfer – Similar deposit option to Western Union. Minimum deposit of $100 required and a maximum of $600. All necessary information like Control Number provided upon successful deposit. RIA Person To Person Money Transfer – Wire money over using RIA transfer service. Minimum deposit requirement of $50 and maximum requirement of $500. Trace ID and Reference Number provided upon successful deposit. Wire Transfer – In order to do a wire transfer, you can contact the cashier to get the routing information to present to your source of the transfer. Book to Book – Allows you to transfer funds between sportsbooks that are part of the same network. Cashier’s Check/Money Orders – Must be sent through the mail so processing time is a little longer. However, for individuals who prefer to keep their credit and debit cards out of the picture, this option meets their needs. Bitcoin – Bitcoin is the fastest and easiest way to receive your winnings. There is a minimum payout amount of $20 and a maximum amount of $10,000. No fees applied and processing can take up to 48 hours. MoneyGram – There is a minimum payout request of $50 and a maximum of $400. Transaction fees depend on the amount requested and payouts typically process within five business days. Check By Courier – Minimum withdrawal amount of $500 and a maximum of $2,500. There is a $50 associated with each payout and delivery time is estimated within seven business days. Bank Wire – Minimum payout of $500 and a maximum of $24,900. Transaction fees depend on the amount being requested and processing generally takes fifteen business days. Transfer to SportsBetting.ag – This is a book to book transfer. Minimum of $500 and maximum of $24,900. No fees applied and transactions are processed within 24 hours. BetOnline has three ways in which you can reach their customer service department—phone, email or live chat. They have email accounts for each of their departments (General, Poker, Casino and Skill Games); sportsbook questions can be sent to skillgames@BetOnline.ag. Their number is 1-888-426-3661. Live chat instantly connects you with a BetOnline representative. 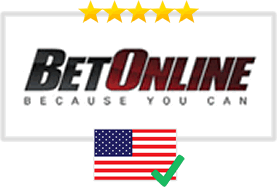 BetOnline’s customer service can be reached 24 hours a day, seven days a week. BetOnline has a mobile betting platform suited for those betting on the go. Using responsive design technology, the mobile version of the sportsbook can function across multiple devices and carriers without any problems. The mobile version can be accessed by simply entering in the site URL into your mobile phone’s browser window—no app download necessary. All of the same betting lines, wagering types, bonuses and security features are present with the mobile version. Live betting lines open at the start of respective sports matches and provide an exciting alternative to your standard sports bets. With live betting, you can bet on the action in real-time and watch as the match unfolds. There are certain rules that apply to live bets and they differ pending the sport being bet on. Live betting lines are time-sensitive, meaning they will expire quickly so you have to act fast if you favor a particular bet. Are The Betting Odds At BetOnline Comparable With The Odds From Vegas Bookmakers? Yes. The betting odds you will find on BetOnline’s sportsbook are comparable to the ones you’d find in a Vegas sportsbook. BetOnline has an advantage in that its betting lines are displayed faster than other offshore sportsbooks, meaning you get Vegas-quality odds quicker than anyone else. Is It Safe To Place Bets On BetOnline? Yes. BetOnline ensures all transactions with their site are 100% secure though Secure Socket Layers (SSL) and 256-bit data encryption to protect all the information you provide. The security of your personal and financial information is a priority for both you and BetOnline and their security protocols keep your information safe.